In its Easter statement, the ‘new IRA’ has declared that it has built a “sustainable military campaign”, but that responsibility for further conflict “rests with the British government”. 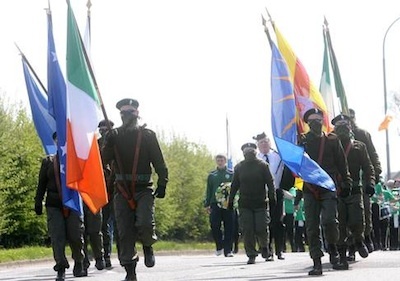 The group, which formed in recent years from an alliance of breakaway IRA groups, said that while Britain denies the Irish people the right to live free from foreign and undemocratic interference, it would continue to use “military force” to assert that right. The statement was the most militant of those issued this week to mark the 98th anniversary of the 1916 Rising. It came as hundreds of commemorations took place in bright sunshine over the weekend to recall the heroic rebellion which encouraged the Irish people on the road towards independence. As in previous years, events spanned the spectrum of nationalism from the formal, official state military ceremony in Dublin through to small, radical wreath-laying ceremonies at memorials across Ireland. The largest number of events was organised by Sinn Fein, a party which is focused on preparations for local and European elections next month. Its Deputy First Minister in the Six Counties, Martin McGuinness was the main speaker at the party’s Easter Commemoration across the border in Monaghan. In his speech, he defended his attendance earlier this month at a royal banquet in Windsor Castle by describing it as an “initiative to further strengthen the process of change and reconciliation”. “Unionists must also participate in this process,” he added. “They need to reach out to republicans.” However, McGuinness was inevitably the focus of strong criticism by his republican opponents. At the Republican Sinn Fein commemoration in Derry’s City Cemetery, Mickey McGonagle said McGuinness had shown “disrespect” to the hunger strikers and the IRA Volunteers who died on active service while fighting the British forces. The president of Republican Sinn Fein, Des Dalton, said the spectacle of Irish politicians greeting and toasting the queen at Windsor Castle was “another step in the attempt to undo the progress made by the revolutionary generation”, while Gary Donnelly of the 32 County Sovereignty Movement said that the 1916 Rising “was not about tuxedos and toasting the queen of England”. One of the largest Easter commemorations was in west Belfast, where hundreds of members and supporters of the rival eirigi organisation gathered for that party’s annual easter Monday parade along the Falls Road to Milltown Cemetery. Veteran Belfast republican Francie McGuigan read the proclamation while a civilian colour party and several bands took part in the procession to the republican memorial in Milltown. Stephen Murney, who was interned at Maghaberry for 14 months, gave an oration which focused on the history of Cumann na mBan - the IRA’s female wing, which is marking its 100th anniversary. The largest parade in the Six Counties outside Belfast took place in Carrickmore in County Tyrone. Organised by the Tyrone National Graves Association, the independent commemoration included a band parade and wreath-laying ceremony at the town’s republican garden of remembrance. Brian Crawley, chairman of Tyrone National Graves, paid tribute to dead republicans. In north Belfast several hundred people attended a Sinn Fein organised event in New Lodge. During her address Sinn Fein’s Jennifer McCann urged the British government to support the Haass proposals on parades and the past. “There is currently an effort on the part of political unionism to roll back on the progress that has been made since the Good Friday Agreement was achieved 16 years ago,” she said. A round-up of all of the statements issued to commemorate the Easter Rising is included in this week's issue.